Scanning into your event can be invaluable in many areas, especially sessions. Using our easy to use handheld devices you can quickly and easily scan all attendees into sessions. This could be just one main one at the beginning of the day or multiple sessions throughout the entire event. Being able to tell what sessions are popular and how many people attended could be extremely useful for future events. Re-marketing to specific groups of people post event is easier, plus you could provide audience analysis for your speakers. By scanning into your session you are also able to report on this information, whether that be the number of attendees in each session, a list of who attended each session or even what sessions attendees visited. This is a particularly good idea if one of your sessions has been sponsored. You will be able to provide your sponsor with a list of who attended. Attendees can use some parts of the system themselves. For example, if you want, one or more of the on-site registration desks can be switched to become CPD certificate printing stations. This is typically done after the initial registration period has finished and the flow of arriving attendees has slowed down. The attendee can go to the printing station, scan their badge and get a CPD certificate printed immediately. It can be printed on paper stock you provide or we can provide a layout that results in the certificate being printed in full on plain paper. If required, each attendee can be given individual access to an online system so that they can see a list of the sessions they attended. 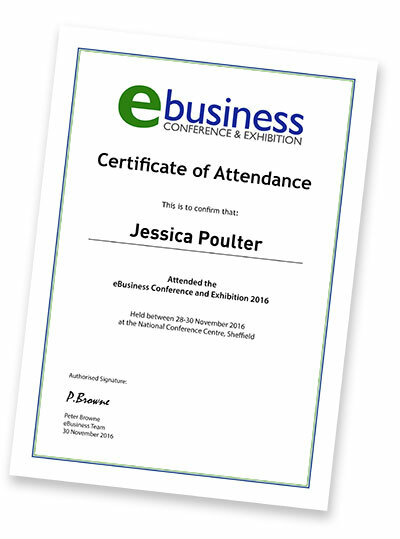 This can then be designed to enable each attendee to download their own attendance certificate. This system can be made available to the organiser who can have administration rights meaning that when an attendee calls after the event and asks for a replacement certificate, the organiser can see the attendee's record on screen and print out the certificate quickly and easily. When an association runs a number of events each year, the online system can provide access to information about all of them. The level of detail to be provided is determined by you. The important fact is that if you need to keep a record of attendance, no matter how detailed, RefTech can help.